I put a message out to a chat list and a Facebook group and got 24 responses from people in Kansas, Missouri, Illinois and Iowa who are all experiencing similar things. Some call it a hum, others a loud roaring sound. Shaking of the house may or may not be involved. Some say this is happening all over the country and perhaps the world. Many people have said that they sometimes hear a loud banging on their exterior house or door. When they go to investigate, no one is at the door or around their house, and they can't find a reason for the noise. It is deliberate, like someone is knocking. One paranormal researcher in Illinois suggested that some of the sounds may be attributed to frost quakes which are the result of water freezing in the ground, then expanding and popping the ground surface. He also says that houses can creak in the extreme cold or heat. This may be the explanation for some of these sounds, but most people replied that it does not explain what they are hearing. Two women in Independence and a woman in Overland Park, Kansas said that they sometimes hear banging on an exterior door just prior to a paranormal event in their house. Could the banging noises be a portal opening to another dimension? Could the louder sounds outside be inter-dimensional openings caused by UFOs entering or leaving our dimension? 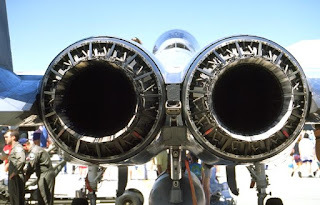 If so, this likely does not explain the sounds of jet engines that go on for hours at a time, or the constant "wa wa wa" sound heard late at night. Are people digging tunnels deep underground? Are there invisible jets on the ground that we can't see? The big question is - why is this happening so frequently right now? Is something big on the horizon perhaps? Are these sounds, like the earthquake lights that are seen so often prior to earthquakes, also an indication of a coming large earthquake or other event? If you've experienced unexplained sounds or knocking please let me know.